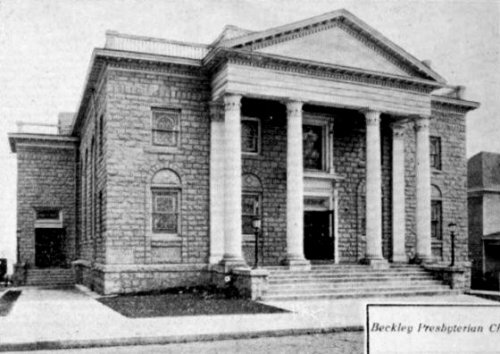 The Beckley Presbyterian Church had its beginning in 1872, although all original records before May 12, 1907 were lost. From a newspaper article and statements from older residents of the community, it is definitely established that about the year 1870 a Presbyterian Church was organized in Raleigh County, WV, under the name "Raleigh Presbyterian Church." For 37 years the congregation, composed of not more than 12 at any time, met in the homes of the people, in the schoolhouse, and in the churches of other denominations. They relied on guest ministers from the Greenbrier Presbytery and visiting ministers of other denominations. The first official church member and Elder was John Wallace McCreery*, who joined by letter on July 21, 1872. *McCreery was born July 31, 1845. He was a lawyer, and had a law office called "McCreery & Patterson" on the corner of Main and S. Kanawha Street. He was a family man, a democrat, a State Senator, and a Prosecuting Attorney for 8 years. He helped form the Bank of Raleigh and was the president the rest of his life. He was president of Beckley Seminary, the old Beckley Electric Light and Power Company, and the Piney Coking Coal Land Company. 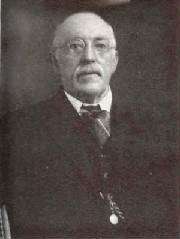 From 1897-1900 he served as Master of Beckley Masonic Lodge No. 95, A.F. & A.M. He died May 22, 1917 at his home on South Kanawha, which was directly across from the present-day church. On May 12, 1907, the Rev. W. S. Patterson was called to be the first pastor of the Raleigh Presbyterian Church. He was a graduate of West Virginia Wesleyan in Buckhannon, WV, and the Union Theological Seminary of Richmond, VA. At that time the church membership was approximately 22 people. Rev. Patterson accepted the call, and the members immediately started plans for a church of their own. Senator McCreery donated a lot on South Kanawha Street, opposite his residence, as the site for a church building. 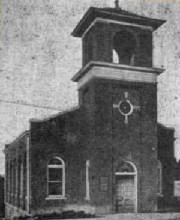 In June, 1909, the first church building was ready for use, and dedication was set for July 25th. It was a substantial structure built of pressed brick, and the cost, including furnishings, was about $8000. 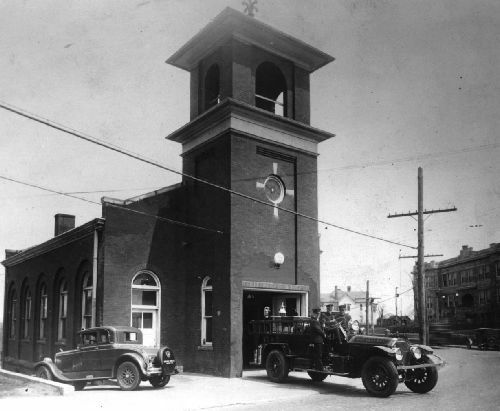 According to the local newspaper, "The congregation met for the first time in their handsome and comfortable new church, the first and only brick church building in the city. The auditorium was comfortably filled, and Rev. Patterson delivered an excellent sermon. Mrs. W. M. Taylor presided at the organ assisted by two coronet players, a duet was sung by Mr.& Mrs. W. MacTaggart and a solo by Mrs. McGavock." Rev. Patterson resigned from the pulpit in October, 1911. He had not only served the church, but the community as well. He taught Bible studies at the Beckley Institute and organized a boys baseball team in Beckley called The Covenanters. (In the picture - First Row: Howard George, Virgil Rhodes, Fred Hawley, Price Hawley, Paul Stanley; Back Row: Beecher Dunn, D.Crozier, Wash Aliff, Jess Crozier, Grady Shumate) Patterson died in 1968 and is buried in the Davidson Cemetery, NC. Rev. T.K. Young of Holden, WV served the church until April 27, 1913 when Rev. 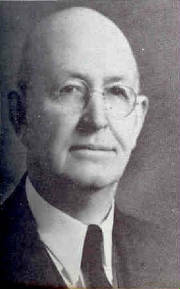 G. N. Thomas of Concord, NC became the new pastor. At that time there were 4 Elders, 2 Deacons, 46 Communicates, and 60 Sunday School members. He resigned in 1917, having brought in many new members. In May, 1917 the church called Rev. C. O. Pardo, then pastor of the Community Church at Glen White. But he stayed less than one year, resigning to engage in YMCA work under the War Work Council. On May 22, 1917, the same time that the church was again looking for a new pastor, Senator John W. McCreery (first Elder and church member who donated the land for the original church building) died at his home on South Kanawha Street. 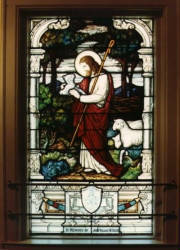 In memory of Senator McCreery, a beautiful stained glass window, "The Good Shepherd," was given to the church by the E. M. Payne family, and it can be seen today centered above the Beckley Presbyterian Church entrance facing McCreery Street. In May, 1919 the Rev. J. L. Lineweaver* of Alderson, WV accepted the call to become the new pastor. During the first year he helped start the new Davis-Stuart Orphanage in Alderson, dividing his time between the two jobs. He served the Beckley church until he retired in 1943. *Rev. Lineweaver was born at Mount Clinton, VA on February 15, 1872 and received his early schooling at Harrisonburg. Working his way through school after the death of his father, he entered Hampden-Sidney College before going to the Seminary to begin studying for the ministry. He received his Bachelor of Divinity degree in 1904, and the DD degree was conferred upon him at Davis Elkins College in 1926. He was aided in his ministry by his wife, Lucy, until her death in 1926, and his daughter, Ruth. Along with his pastoral duties, Rev. Lineweaver was very active in community affairs. He was a charter member of the Beckley Chamber of Commerce and vice president of the Co-operative Building and Loan Association. In1926-27 he served as probation officer in the county. He was elected President of the Raleigh County Board of Education in 1933, and was a charter member of Kiwanis International, serving as President in 1941-43. 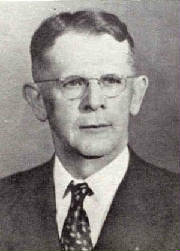 Dr. Lineweaver died March 18, 1956 after serving as Pastor for 16 years and Pastor Emeritus 12 years. The church leaders saw the need for a manse for the pastor, and in October, 1919 bought the "Foote" property at 303 North Kanawha Street from Elder William MacTaggart for $5800. This home still stands today, although no longer the manse. In 1921 Miss Kate Johnson, a new member from VA, became the first secretary of the Beckley church and remained in that position until she retired in 1943. Over the years, she worked closely with Dr. Lineweaver in the duties of secretary and into the outreach field of Sunday Schools that was conducted in many outlying areas. The Ladies Aid and Missionary Society of the Beckley church was active as early as 1911. They had bazaars, silver teas, suppers, days of self denial, parcel post sales, and quilting bees to raise money. From their treasury, they paid for items such as part of the new organ, repair of the roof, painting the church, stained oil paper for the windows, printing invitational cards, and purchasing new lights and electrical wiring for church repairs. They cleaned and decorated the church, gave to and supported Sunday School programs in other churches, and collected for foreign mission work. In September, 1921 the Session consented to the reorganization of the women and girls on the Auxiliary Circle plan. That was the beginning of what we know today as "Circle Meetings." Another decade had ended with the church steadily growing. The building debt had finally been paid off, and already they were in need of more Sunday School rooms. A lot close to the old church was purchased for a new church building from Hal M. Scott, and the decision was made to erect a stone building at an estimated cost of $75,000. 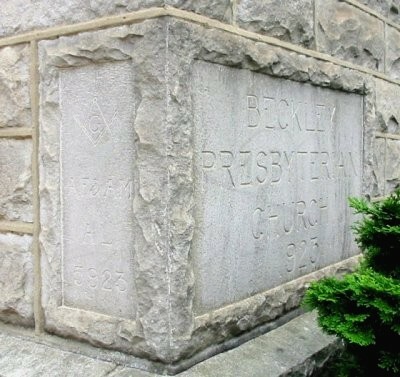 It is unclear exactly when the name Raleigh Presbyterian Church became Beckley Presbyterian Church, but by now it was being referred to as the latter. On September 3, 1923 the cornerstone was laid by the Masonic Fraternity, Beckley Lodge Number 95 with a box of articles sealed inside. It was estimated that over 1000 people attended the ceremony. Over the next few years, the church had a large out-reach program with Sunday Schools at Teel, Beckley Junction, Cranberry, McAlpin, Mabscott, Raleigh, Skelton, Sprague, Stanaford, and Sylvia. Members and church staff worked in the various Sunday Schools as superintendents, treasurers, choirs, and teachers. And as the schools grew, so did the church membership. Old church is sold to the city and used for a fire house. In August, 1924 records show that they were still using both buildings. Then in the fall of 1925 the old church property was sold to the City of Beckley for $23,000 which included money for renovation. The original building still stands and has served the City over the years as a Mayor's office, Police and Fire Department, Sanitary Board, and Council Chambers. 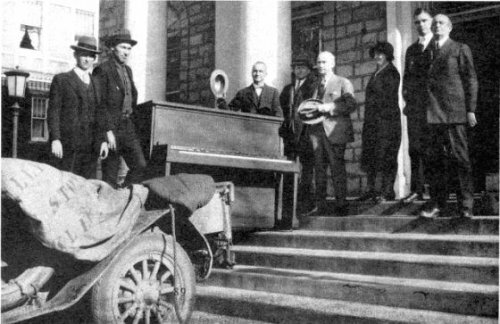 Kate Johnson watches a piano being lifted up the steps. The dedication for the new stone church was held on October 2, 1927. In 1928 Rev. C. V. Brown, Jr. was appointed Associate Pastor. He left after one year and was replaced by Rev. F. L. Shannon of Enfield, NC. Shannon took on the task of "Minister for Community Work." This relieved the church of the responsibility of Sunday Schools at three locations - Sprague, Cranberry, and Skelton. Another decade was coming to an end, and by 1930 records showed a Main Sunday School, and Cranberry, Skelton, Teel, and Stanaford outpost Sunday Schools. The Woman's Auxiliary (14 Circles) were still supporting Foreign Missions, Home Missions, the Davis-Staurt Orphanage, and Greenbrier College. Along with their spiritual life, they studied church literature, served in Christian Education with the young people, in outpost Sunday School programs, and as Pastor's aides. Although the church continued to grow, it was beginning to feel the crunch of the depression. They cut back on electricity, outpost Sunday Schools, and staff salaries, including the pastor's. By the late 1930's, Teel, Raleigh, and Stanaford were the only remaining outposts, as community churches had been formed and replaced the need for outpost Sunday Schools. The Church Library was organized in July, 1939 with the object of securing valuable Christian reference books which, free of cost, could be used by all church members in the study of God's word. The Library started with 17 books that were donated by church members. Several of the Circles as well as other church members made monetary contributions for purchasing books. Over the years many ladies have served on the Library Committee and as Librarians. From a collection of 17 books, the number is now well over 1000. Today the Library is located in the Educational Building. The year 1939 closed with two outpost Sunday Schools and Mission work sponsored at Raleigh, Terry, and Wright. The enrollment in the three Sunday Schools was 675. This is an updated link. It's the same site but was moved to a new location.